I’ve got another sugarless baking experiment for you today, imaginary internet pal! I immediately thought of no-bake cookies (and also thought I was some kind of genius for coming up with that.. DUH, Natalie.). The banana takes the place of refined sugar in this recipe. If you’re not into the whole sweeten-stuff-with-bananas thing, this recipe isn’t for you. The banana isn’t overpowering, but you can taste it in there. I was a fan, husband was a fan, toddler was a fan. They tasted plenty sweet to us without the sugar, but that could be because we aren’t eating any real sugar and our taste buds have changed. I had a little cookie-fruit-pizza-bite-thingy yesterday morning at MOPS (you’ve been on Pinterest, you know what I’m talking about) and it tasted SO SWEET. A month ago, I would have downed a handful of them and started looking for something else. Hooray for detoxing! 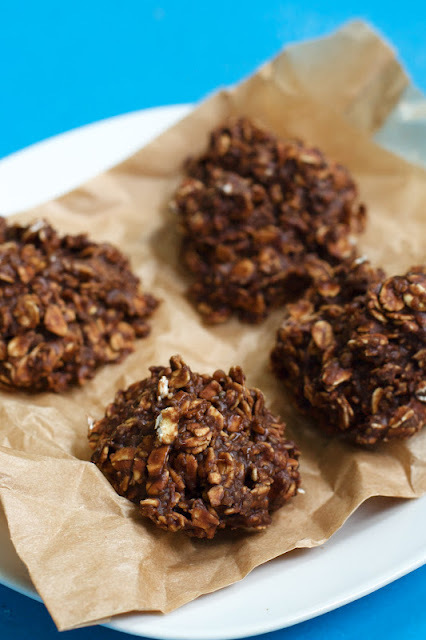 If you’re looking for a quick and refined-sugar free cookie, give this one a try. But it’s okay if you don’t- I know my girl Marianne will (this post is really just for her anyways). Better get crackin’- nap time is almost over.. In a medium saucepan over low heat, combine banana chunks, chocolate chips, nut butter, chia seeds, milk and salt. Heat for 2-3 minutes or until just beginning to bubble. Using a fork, mash the bananas in chocolate mixture until smooth. Bring mixture to a boil and boil for 2-3 minutes. Remove from heat, add in vanilla. Stir in 1 cup oats until well-coated. If the mixture seems a bit runny, add up to ½ cup more oats until the mixture is scoop-able. Spoon rounded tablespoonfuls onto waxed paper and let cool in the fridge or freezer until firm. Enjoy the cookies right away or keep refrigerated. Hello! I ran across your blogsite via Pinterest, searched Vegetarian, and found these! After a quick “pantry check” in my brain, 10 minutes later, I have a plate full in the freezer! It was that easy! I was out of chia seeds, so I used flaxseeds…can’t wait to taste them! (the part I licked off my fingers after rolling the balls tasted yummy!) Happy Day! Any way to replace the nut butter? I want to make these school friendly for my daughter. Sounds yummy!